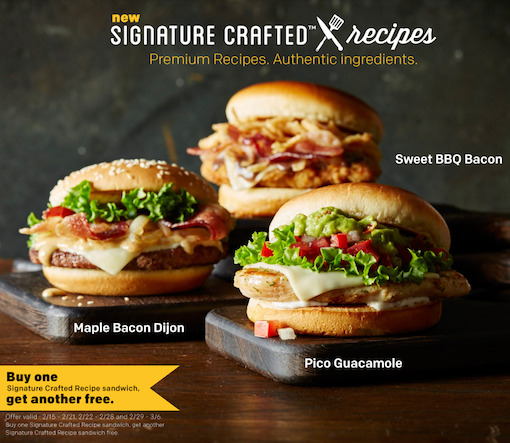 McDonald's is testing yet another version of its build-your-own-burger platform under the name "Signature Crafted Recipes" in western Washington State. BurgerBusiness.com reported exclusively in December that McDonald's Corp. had trademarked the name "Signature Crafted." Maple Bacon Dijon has bacon with maple seasoning, creamy Dijon mustard, caramelized onion, white Cheddar cheese and crispy lettuce. Pico Guacamole has pico de gallo, guacamole made with real Hass avocados, creamy buttermilk ranch sauce, white Cheddar and leaf lettuce. Sweet BBQ Bacon has a sweet BBQ sauce, applewood-smoked bacon, caramelized onion, crispy onion and white Cheddar. Finally, a type of bun can be specified. The Maple Bacon Dijon and Pico Guacamole topping packages have been used before in the "Chef Crafted" tests in San Diego. A Buffalo Bacon option--with blue cheese, buffalo sauce and bacon--was part of that test. The idea is to get the build-your-own feel and be more drive-thru friendly without the complicated, multi-ingredient operation challenge that is the full-scale Create Your Taste platform. That platform is rolling across Australia and the UK, and is in dozens of stores in the U.S.